There are days that I don’t know what I would do without my slow cooker. Those days are usually Mondays. I don’t know what it is about Monday that usually leaves me running around like a chicken with their head cut off. Maybe it’s getting back into that weekday routine after being relaxed all weekend, or maybe it’s because I tend to cram everything humanly possible into the few short hours that the kids are in school. My guess is a combination of the two, but thankfully, the invention of the slow cooker makes one Monday task an easy one. As I mentioned in my Eating Healthy On A Budget post, I like to purchase meat in bulk. I have staple meats that are always on hand in my freezer, ground beef, pork loin, chicken thighs and chuck roasts. These are staples for me because they can be prepared using different cooking methods, and are perfect for tossing into the slow cooker while still frozen! Sometimes I plan my week with grand intentions of trying tons of new recipes, but then I wake up with a headache, end up having to go out somewhere or just flat out don’t feel like cooking (I know, that last one is crazy, but it happens from time to time). Those are the times I thankfully for my supply of frozen meat options, my slow cooker and my collection of recipes on Pinterest! This recipe is actually intended for pork ribs, but I didn’t have pork ribs…I had a pork loin roast, so I figured why not?! 1. In a small bowl, mix together the salt, pepper, Chinese five-spice, and garlic powder, then massage the mixture onto the pork. 2. If using the jalapeno, toss the sliced piece into the bottom of the slow cooker. Add the vinegar, coconut aminos and tomato paste. Stir well to combine the tomato paste with the liquids. 3. Add the pork roast and cook on low for about 8-10 hours. 4. When the pork is done, shred and mix with the juices in the slow cooker. Serve. This pork had a wonderful, sweet flavor with just a hint of spice from the jalapeno. I served this with sweet potato mash and sauteed spinach, but this is yet another dish that would work perfect as a lettuce wrap. There are really very few meats that wouldn’t work well as a lettuce wrap, right?! I’ve clearly been on a Asian kick with my meals this week. I think it might just be an excuse to eat lettuce wraps and Sriracha, because that is exactly how I used the left overs from this meal today. 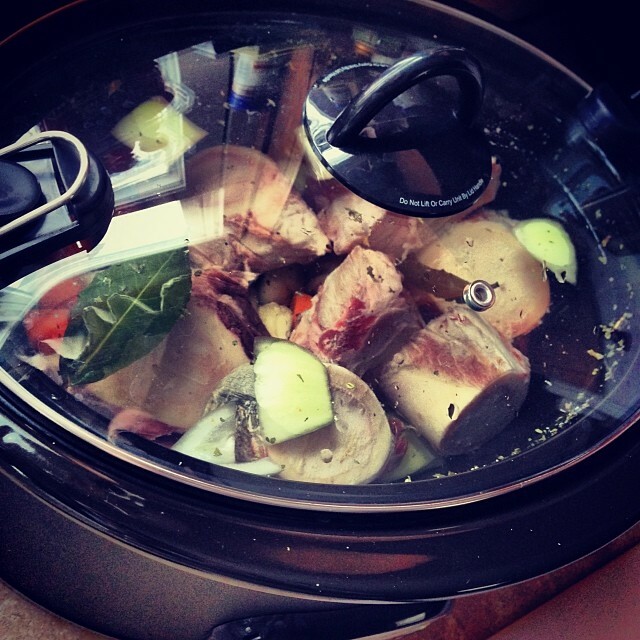 Do you own a slow cooker? If so, do you use it a lot or does it just sit on a shelf in the pantry? Yesterday afternoon, I was doing my workout and began debating what to make for dinner. I remembered I had a recipe for Jerk Chicken that I wanted to try. So as soon as I was done, I ran downstairs, mixed some recovery drink and began prepping my spices and chicken for cooking. Now the recipe I found wasn’t a true Caribbean style jerk chicken, but it has spice and looked really tasty, so I had to give it a try. 1. Mix all of your spices together in a bowl to make a rub for the chicken. 2. Rinse your chicken legs in cold water, then place into a bowl. Sprinkle the chicken with the spices and rub them into the meat thoroughly. Make sure you try to get it under the chicken skin, too. 4. Set the slow cooker on low heat and cook for 6 hours or until the chicken meat falls off the bone (slow cooker times and setting vary so adjust accordingly). 5. You can serve the chicken on the bone, or remove them since the meat falls off so easily. This recipe made my kitchen smell amazing and was very moist and flavorful. I used the full teaspoon of cayenne pepper and didn’t find it to be very spicy, but feel free to use less if you are sensitive to spicy food. You could even substitute with other spices that are more traditional to the Caribbean style if that’s what you prefer. Play with it. Have fun! That’s what cooking should be about! 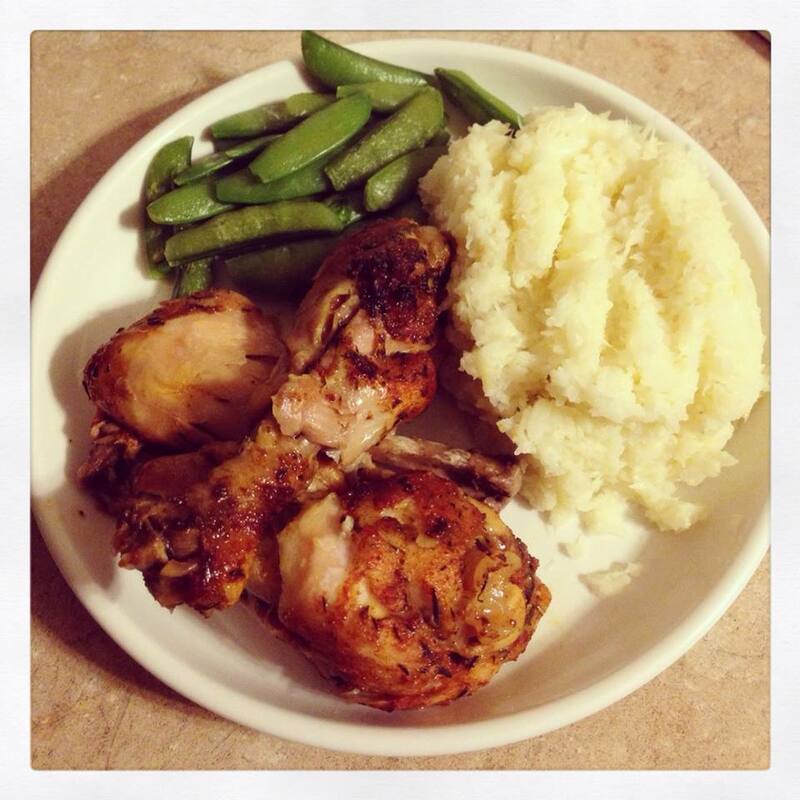 I served the chicken with some mashed cauliflower, and steamed snap peas. Everything was simple, quick and healthy, which is so important to me. What kind of recipes do you tend to gravitate to? Do you like to try new things or do you tend to stick to what you know? Thanks to the polar vortex nonsense, it’s been super frigid across the country and what is better on a cold day, than watching movies, cuddling under warm blankets and eating some yummy comfort food?! For this recipe, I substituted the usual decadent, mashed potatoes for mashed cauliflower and I really enjoyed it! 1. 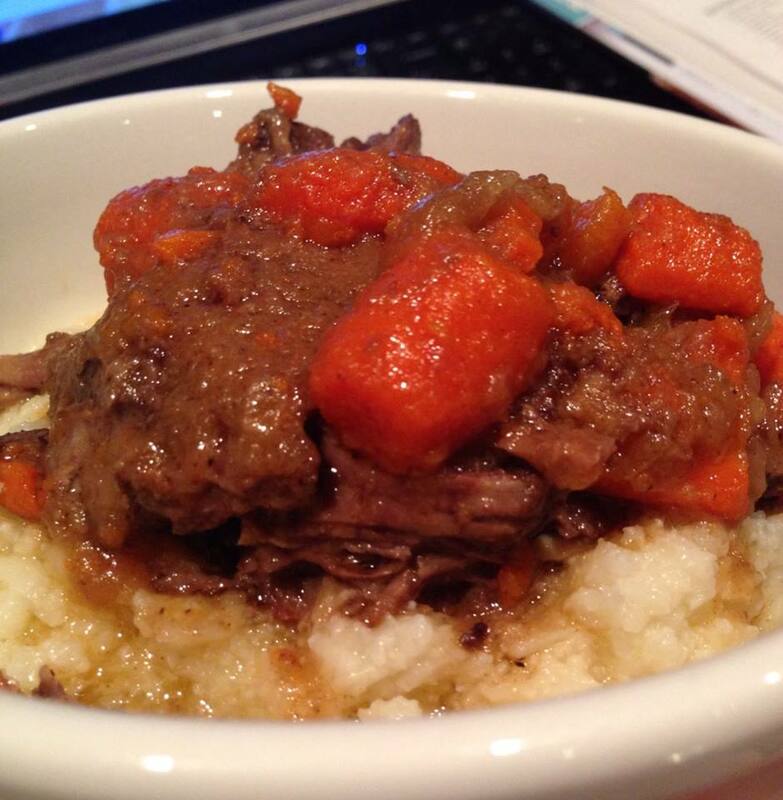 Using the tip of a sharp paring knife, make 10 small slits deep all over the pot roast. Insert the garlic cloves as deep into the slits as possible. 2. Season the roast on all sides with the salt and pepper. 3. In a Dutch oven, heat the oil over high heat. Carefully add the meat and sear on all sides until well browned, 4 to 6 minutes per side. 4. Add the vegetables, carefully add the stock or wine and cover the pot. 6. Allow the meat to rest 10 minutes. Slice or pull the meat apart into serving pieces and serve with the vegetables over the mashed cauliflower (recipe below). 1. Cut the cauliflower into large pieces. 2. Place cauliflower in a pot of water. Make sure it is fully immersed. 4. Drain the water from pot. Leave cauliflower on low heat, and mash with a potato masher. 5. Add butter and seasonings. 6. Mix well. Serve hot. I was a little unsure if Mike would like the mashed cauliflower, instead of traditional mashed potatoes, but he really enjoyed them and said he didn’t feel overstuffed like usual after eating dinner. That’s a big win to me…now if only I could get the kids to eat them…sigh! 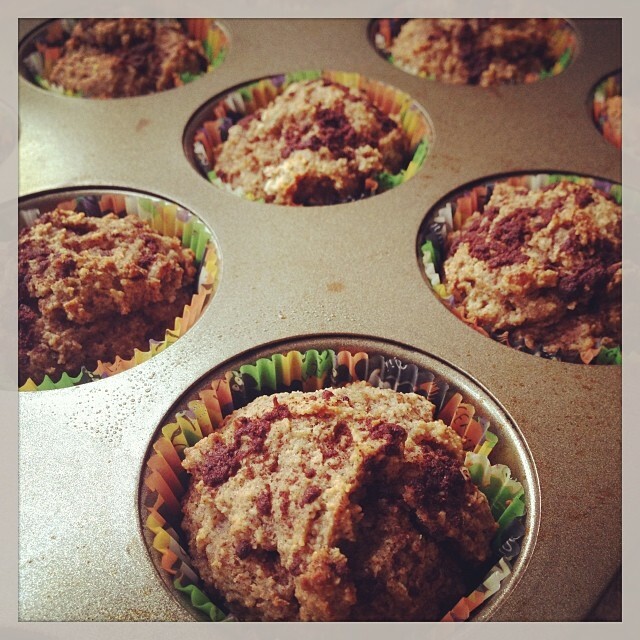 Have you tried making your favorite comfort foods healthier? If so, what have you substituted? Everyone has those nights when they need something quick and easy to make for dinner. You may not be into meal prepping yet (which is a life saver) or maybe you just don’t feel like eating what you prepped again, but you also don’t want to sabotage your healthy eating. 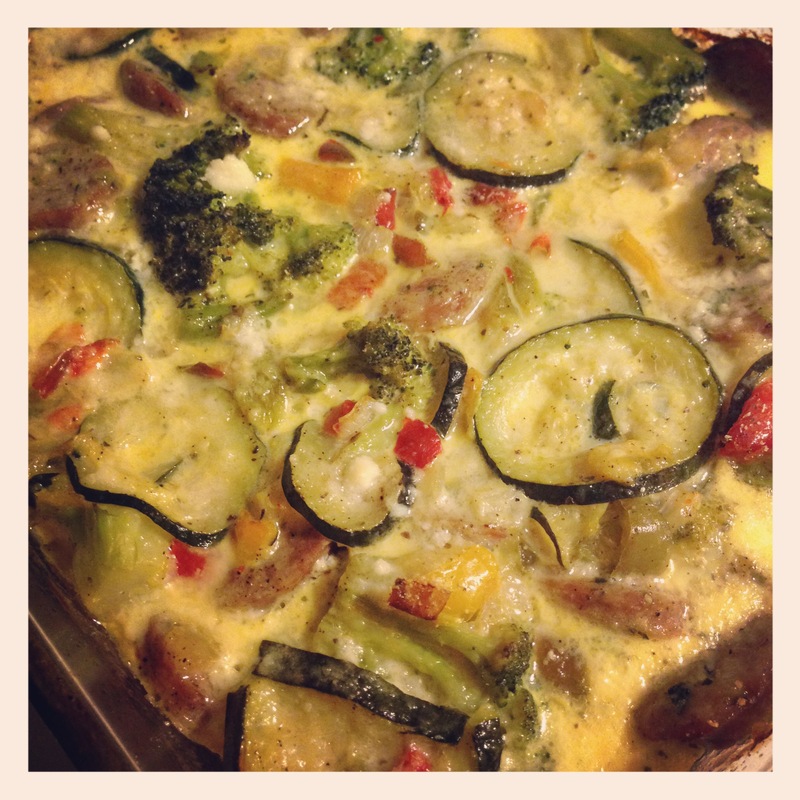 This recipe is perfect for those nights! 1. Place the chicken strips in a gallon sized zippered bag. 2. In a small bowl combine the olive oil, cumin, chili powder, oregano, garlic powder, and salt. Sprinkle over chicken; toss to coat. 3. Put in the refrigerator to marinate 30 min. to overnight. 4. When ready to bake, Preheat the oven to 400 degrees, then coat a 13×9 baking dish with cooking spray and place the marinated chicken strips in. 5. 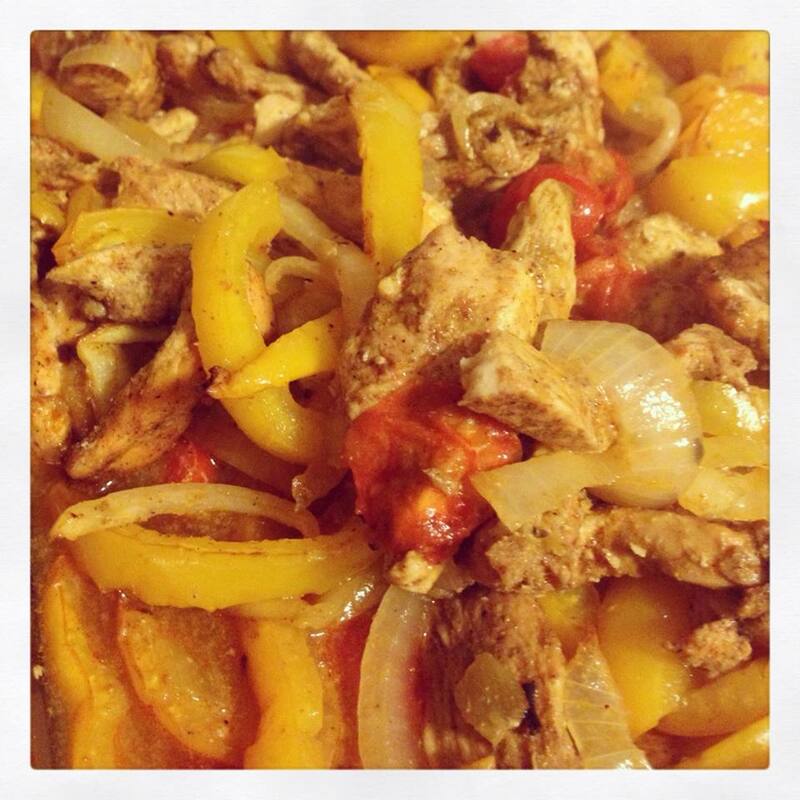 Add tomatoes, jalapenos, onion and peppers to the dish and stir to combine. 6. Bake, uncovered, for 25-30 minutes or until chicken is no longer pink and vegetables are tender. This recipe came in handy yesterday! I was busy studying for my midterm most of the day and didn’t think about dinner until late. Mike and I started working out together at night, so I was able to prep this, toss it in the oven and by the time we were done with our P90X3 workout, our post workout meal was ready and waiting! How perfect is that?! If you are following a paleo or gluten-free lifestyle, serve these as lettuce wraps and top with a little guacamole, a squeeze of lime and hot sauce, if you desire. If you are non-paleo, but gluten-free, you can use white corn tortillas and if you are just eating clean, serve these with whole-grain tortillas and top as you wish. This is really a great recipe for entertaining too, since it is easy and healthy, but can fit different nutritional lifestyles with ease. 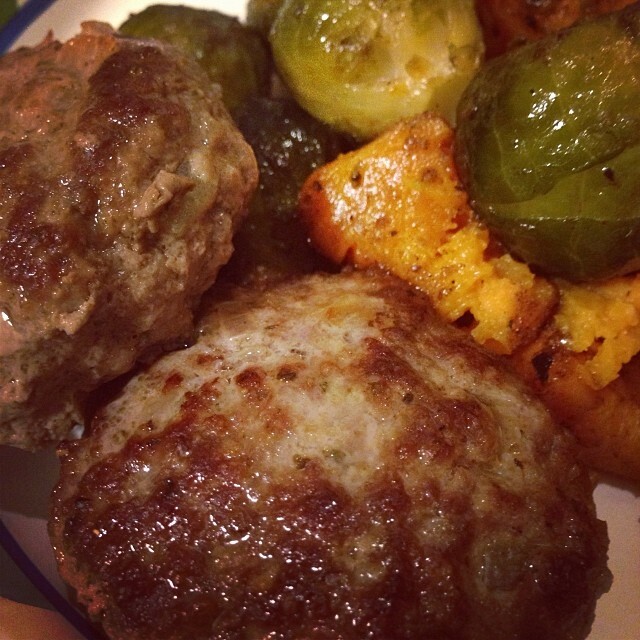 Do you have any healthy, easy, go-to recipes that you rely on when you’re short on time? While collecting recipes this past week, I finally decided to give bone broth a try. I’ve seen quite a few people on Instagram share photos of their crockpots loaded with bones, veggies and water, but I had no idea what the benefits of this broth were and why they were doing this. Then I decided to consult my good friend Google, since he always has the answers (he’s such a know it all…it’s a little obnoxious sometimes). If like me, you are not aware of the benefits of consuming bone broth, please take a moment to READ THIS you’ll thank me after you do. If you ARE familiar with bone broth, well….WHY DIDN’T YOU TELL ME ABOUT HOW AWESOME AND EASY IT IS?! This is the recipe that I used for mine. I already have a chicken carcass in the freezer and plan on making a batch of chicken bone broth after I roast another chicken next week. 1. Add the vegetables to the bottom of your slow cooker. Then place the beef bones on top. 2. Tuck the bay leaves between the bones, sprinkle with salt and then drizzle the bones with the apple cider vinegar. 3. Add enough water to cover everything. 6. Portion into tupperwares and place in the fridge. If your bones were fatty, you can skim off some of the fat after it separates and sets in the fridge. The broth will turn into a beef gelatin, so don’t be alarmed. The broth will keep in the fridge for a few days or if you freeze it, it’ll last for several months. So far I’ve tried heating up the broth and drinking it like a tea and I’ve also sauteed some veggies and then heated the broth with them to make a quick, healthy, lunchtime soup. From now one, I’ll be using this in place of boxed stock for all of my recipes as well. Why should I spend my hard earned pennies on boxed stock that isn’t as good for me as the liquid from the Gods?! On a side note, Mike and I also started P90X3 last night, so keep an eye out for a review of it once we complete week 1! Have you tried bone broth? If so, I’d love to hear anything different you do in your recipe. If you’re new to this, are you considering making it since reading this post? As I posted yesterday, I’ve started off the New Year by collecting new recipes, heading out the grocery store to collect ingredients and with a focus on resetting my system to not feel the need to constantly consume sugar. So far things are going well with my sugar addition and I haven’t been rocking back and forth in a corner crying out for a cookie. I honestly believe that going back to clean eating and being aware of what I put into my body is making this process a lot easier. The past 3 days I’ve been busy in the kitchen and I couldn’t be happier. The kitchen is truly my happy place, when I know what I want to do and I’m feeling inspired, which is the complete opposite of what I was feeling in there during the holidays (unless I was baking cookies, which is where the issues started, so I digress). 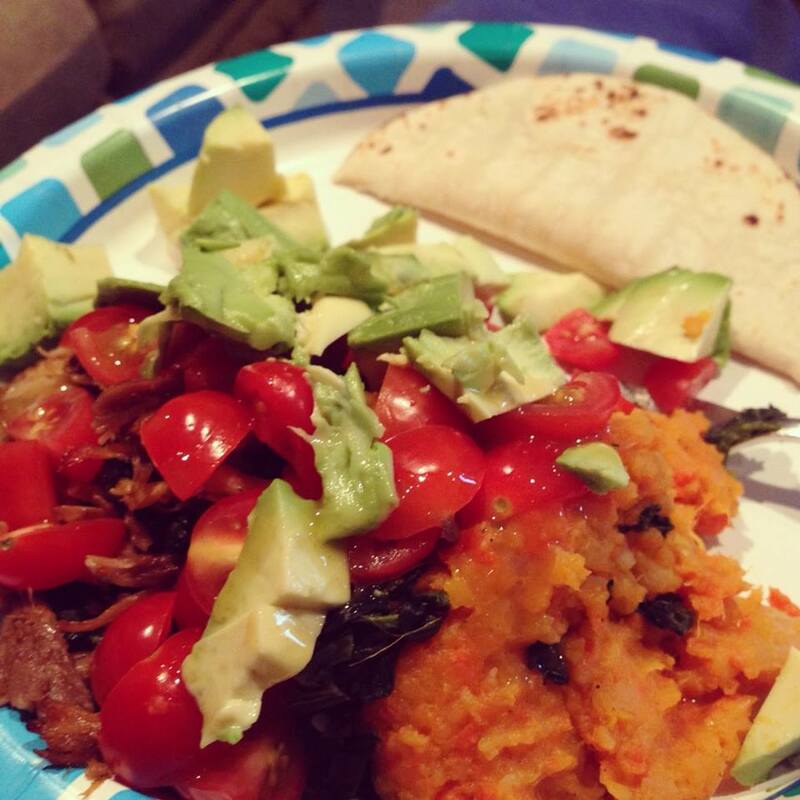 I have a major love for tacos and for sweet potatoes, so when I stumbled upon a recipe that included both, I knew I had to make it. This is also when I realized I’m running very low on spices in my pantry so if Mother Nature cooperates today, I’ll be going out to restock. I apologize for my lack of professional photography with my food photos. I promise to work on it this year. 1. Place sweet potato, carrots and turnip in a pot and cover with water. Bring the water to a boil, and cook for 20 minutes. Drain the mixture. Place them back in the pot or in a large bowl, add the sea salt, and pepper. Mash them together. 3. To assemble: put a scoop of smash on a plate. Top with ¼ of the meat mixture. Sprinkle with the toppings! This recipe was quick and delicious! I was leery at first because I’ve never eaten, let alone cooked with turnips, but I really enjoyed the flavor of this smash. It had a nice sweet flavor to it which really balanced out the meat topping and all of the hot sauce that I like to use. I topped mine with some cherry tomatoes, avocado, hot sauce and a squeeze of lime. I also toasted a white corn tortilla (which gluten-free but not paleo) on the stove to go with it, but I honestly didn’t even need it. I think I prepared that just in case I wasn’t a fan of the recipe. 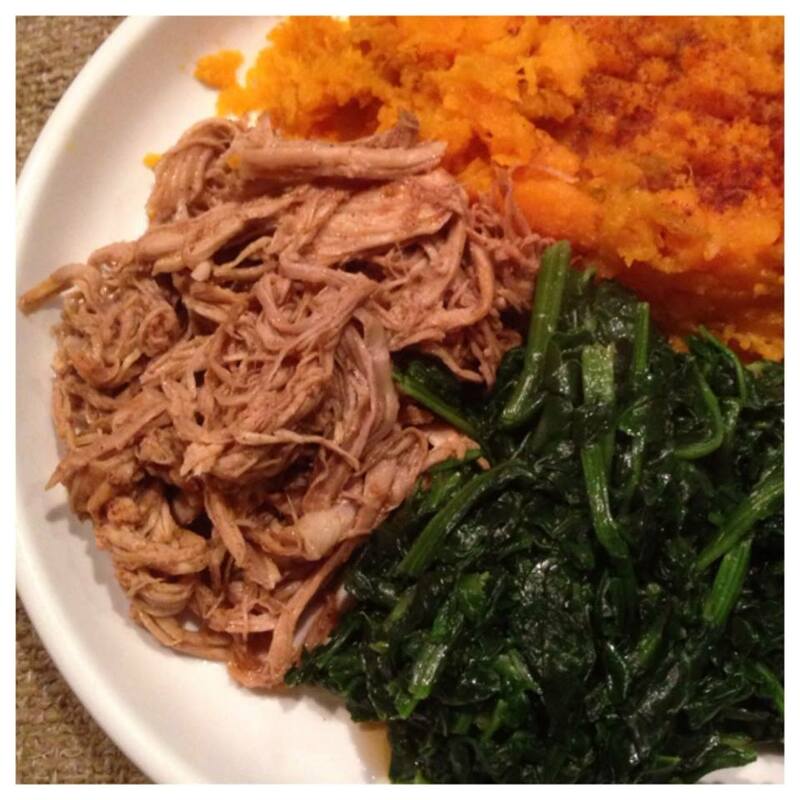 The smash can be used as a side dish with any type of protein so if you are not a fan of taco meat, at least make the smash and have it with some pot roast, chicken or any other protein of your liking. What do you like to top your tacos with? I never thought I would enjoy a taco without sour cream and lots of cheddar cheese but now I couldn’t imagine using either of those.